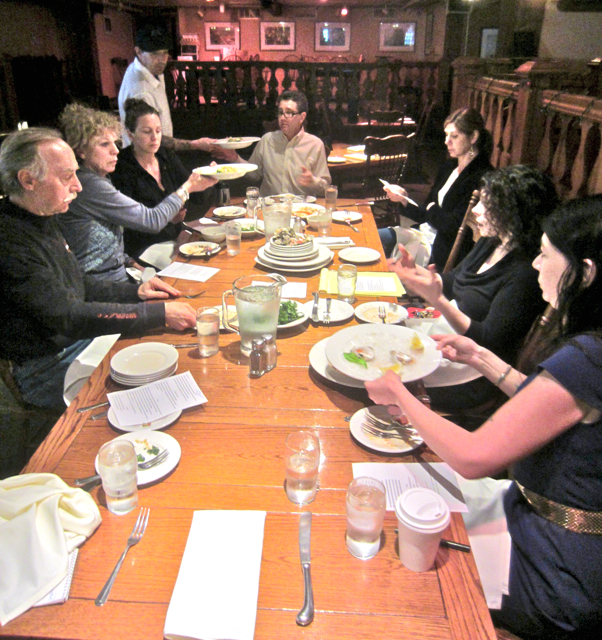 Note: This story appeared in the April 17, 2013 Arcata Eye, as Abruzzi was developing its lunch menu. Dishes described herein don’t necessarily appear in the same form on the final menu. – Ed. JACOBY’S STOREHOUSE – Arcata is looking forward with bated breath to Abruzzi’s lunch menu, to be served in its familiar Jacoby Storehouse location beginning Monday, April 22. Showcasing fresh pasta made one floor up in the much-anticipated PastaLuego, the menu is focused on breezy dishes that showcase Italian-Italian, rather than American-Italian, style cuisine. Lest I be called a snob, let me reassure you that I enjoy a hearty Jersey-style plate of noodles and red sauce in all its Sopranos-esque glory. That kind of food, this is not. This reporter was blown away at a recent pre-opening tasting, attended by Abruzzi’s owners, higher-uppers and yours truly. In the former Bon Boniere spot in the lobby upstairs, PastaLuego is taking shape for a late spring opening. However, its new, Emilio Mitidieri-designed pasta machine is already turning out forms of pasta familiar and exotic. But before you can buy them OTC, they’ll be on the Abruzzi lunch menu. The dishes served up by busy chef Josh Wiley were tentative, some not including all ingredients, and were evaluated for every detail – from cooking time to size of portions, spicing to sauce ratio, even the curl of the new, unfamiliar pastas and what to call them. The glory of the menu is pasta, often with a protein addition so no one risks leaving hungry. Not to shortchange protein – it’s my middle name – but fresh pasta is the point here. The dishes are Roman traviatta style at its Californian best. Have you had gigli? Neither had I. It’s a “small pasta form, twisted like a lily in bloom,” as the menu handily and aptly describes. That one the chef is still noodling around with (ha, ha!) – the lilies were slightly too long for the round table’s liking. The peppery sauce of asparagus and prosciutto needed a little tweaking too, which was duly promised, but the tender-sweet seared scallops atop needed no altering. Moving down the menu, the freshness of the fettucine was underlined by that eternal crowd pleaser Wild Mushroom Alfredo, and the gnocchi with putanesca sauce were cohesive, light and pillowy, which is no small feat, as all you home-rollers know. The bucatini was an unfamiliar noodle, too – it’s a spaghetti-shaped pasta that’s hollow in the middle, the better to sup up the refreshingly clean and simple plum-tomato sauce, redolent of fresh basil and garlic. Appetizers were also good. Kumamoto oysters with plum tomato and horseradish sauce; if you like oysters, you’ll be very pleased. I do, so I was. A poached egg on toasted brioche with anchovy and lemon-parsley gremolata was creamy-cream creamy. I always applaud a poached egg appetizer accurately done, because it’s just a matter of seconds until the egg is an epic fail. The baby kale salad was shockingly tender; one wonders 2what torture the child kale is put through to effect such velvety lightness. No cud chewing here. The heart sinks when the mountain of tough-as-nails grown-up kale looming in the crisper at home is recalled. With five other pasta dishes as yet untasted, I look forward to lunch here. The portions are fashionably reasonable, the chef has an admirably deft hand, the combinations were both traditional and innovative and the pasta was, as advertised, fresh. This entry was posted on Tuesday, April 23rd, 2013 at 4:40 pm	and is filed under Opinion, Scene. You can follow any responses to this entry through the RSS 2.0 feed.